Every day Master Ruiyan used to call to himself, "Master!" Again, he would call, "Thoroughly awake! Thoroughly awake!" and he would answer, "Yes! Yes!" "Don't be deceived by others, any day or any time." Or "Be aware!" (Aitken); "Be awake, be alert!" (Cleary); "Wake up, wake up!" (Low); "Clear all the way" (Loori); "Be wide awake!" (Sekida); "Be alert!" (Senzaki); "Are you awake?" (Shibayama). What is he saying? Who is he talking to? It's easy to approve oneself, but what does it mean? Although this is good advice, of what value is it? It just misleads people. Bah! He should hit himself on the side of the head. Old Ruiyan himself buys and sells. He has many puppet gods and devils which he plays. But why? Look! One is calling. One is answering. One keeps awake. One is not deceived by others. But if you get stuck there, that's not it. If you were to imitate Ruiyan, it would be the understanding of a fox. Is simply that they perceive the discriminating consciousness they've had all along. Fools take it for the essential self. Or: "this is the source of endless birth and death; /the fool calls it the original self" (Aitken); "It is the root of infinite eons of birth and death, /Yet the ignorant call it the original human being" (Cleary); "The mind is the cause of the endless cycle of birth and death, /Yet ignorant people take it for the original man" (Low); "The seed of birth and death through endless eons: /The fool calls it the true original self." (Sekida); "On finding the seed of birth and death, /Foolish people call it the true person!" (Senzaki); "...Yet ignorant people take if for the Original Man" (Shibayama). To study the Buddha way is to study the self. To study the self is to forget the self. To forget the self is to be confirmed by the myriad things. To be confirmed by the myriad things is to cast off body and mind as well as those of others. No trace of realization remains and this no-trace is continued endlessly. Yantou (at the conclusion of BOS75) said to Ruyian, “If you affirm this, you are not yet rid of the root of defilement. If you do not affirm it, you are immersed in endless births and deaths." We can be sure Ruiyan examined these words deeply in his zazen. "How is it that my affirmation would show the root of defilement? And my silence would be a matter of relativity?" His ultimate resolution of these doubts is reflected in his custom of calling "Master!" to himself and responding as he does. Ruiyan did not just use this calling and answering as private practice. He would actually take the high seat before his assembly and go through the recital by way of a teisho. He was not simply indulging in ethical correction, as when you muse at the end of the day on the awkward things you said or did and resolve to do better tomorrow. Such contemplation is useful, but Ruiyan had a different purpose. With Ruiyan's practice of calling, his body and mind dropped away -- calling "master" was the the final step in Dogen's sequence (above). 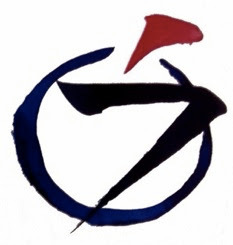 The direct aim of Zen effort is written explicitly into Ruiyan's script. Zen meditation is not idle or undirected sitting, but has a definite aim, illustrated by Ruiyan's calls: to know the true self, to be awake and aware, and to be free from illusions and delusions developed by learned habits of association and thought. Wumen's comment warns of two pitfalls: (1) mistakenly recognizing the superficial personality for the real self; (2) imitating the practice of the exercise without the inner spirit. Right now, can you call and get an answer? Your response must be a genuine firsthand reflection of your own realization, not a contrived imitation of somebody else. Althouth Ruiyan talks to himself, we should not mistake this as simple-mindedness. If you can see into his teaching, then, when it is warm, all the way to heaven it is warm; when it is cool, all the way to heaven it is cool. If, however, you go to the words to see this, then complications are sure to arise. But say, this soliloquy of self-approval is easy to do, but what does it have to do with reality? Without imitating Ruiyan and without falling into words and ideas, how do you understand the truth of the master that transcends time and space, self and other, and indeed, life and death itself? I meet him wherever I go. Yet I am not he! Will you accord with what you are. The verse (above) is similar to what a Sufi teacher said about Allah. Allah is reputed to have said, "I was a hidden treasure and yearned to be known. Then I created creatures in order to be known by them." It looks as though Ruiyan is doing the same. Yet what is the "self" to which Ruiyan calls? Multiple personality cases suggest there can be more than one. One of the ways to treat multiple personality disorder is to merge the personalities into one whole. For the individual personalities, however, to be merged is tantamount to dying, and some of the personalities are as afraid of merging as people are of dying. Is it possible we are all a personality of a multiple personality? Is the master to whom Ruiyan calls a multiple personality? [Not only are there be multiple selves per body, but also multiple bodies per self.] Jewish philosopher Martin Buber suggested that I on its own is an abstraction; the concrete fact is I-Thou or I-It. In other words I is but one element in a complex situation. Perhaps our security in what we call I is misplaced and because of this misplaced security, we might be missing something very important. When Ruiyan was still a monk undergoing training, he had an interview with Jiashan Shanhui (Kassan Zenne, 805-81, 11th gen, disciple of Chuanzi "The Boatman), who asked him "Where are you from?" "From Lying Dragon Mountain," answered Ruiyan. Lying Dragon Mountain was where his former teacher, Yantou, lived. "Did the dragon rise up when you left there?" Ruiyan in answer looked about him. Jiashan then said, "You apply a burning moxa cure to skin which is already burned." "What's the use of your undergoing such torture?" Ruiyan replied. Jiashan said nothing. Perhaps Ruiyan thought he was winning this Dharma battle. He continued to press Jiashan, saying, "Thusness is easy to deal with, not-thusness is difficult to deal with. If you are in a state of thusness, you are wide awke. If you are in not-thusness, you are in emptiness. Are you in thusness or in not-thusness, say quickly!" "Today," replied Jiashan, "you have made a fool of me." Moxa is a dried and refined herb which is burned at various points on the body as a cure for certain conditions and ailments. Be constantly in the state of jishu-zammai (from ji, self; shu, being one's own master; zammai, samadhi) wherein the action of consciousness ceases and absolute stillness reigns throughout the body and mind. But the master of the mind is still aware. "Deceive" also translates as "delude." Thus, "Never be deluded." But who are the "others"? In the end it is only our own delusions that delude us. Consciousness by its very nature is impermanent, but consciousness builds up and believes in a permanent ego. Dependence on that ego is the source of all delusions. After Ruiyan's encounter with Jiashan (above), Ruiyan must have felt triumphant. In later years, however, he must have remembered this dialog and said to himself, "Was it not I, after all, that was made a fool of? I was too green to appreciate Jiashan's maturity. The word Jiashan used for "make a fool of," is virtually identical to the word for "deceive." So Ruiyan's "never be deceived" can also be translated as "never let yourself be made a fool of." A monk came to Xuansha Shibei (Gensha Shibi, 835-908, 13th gen, disciple of Xuefeng), and was met with the question, "Where did you come from?" The monk answered, "From Ruiyan." "Why didn't you stay there?" "Because Master Ruiyan passed away." "I am very sorry to hear that. How did Ruiyan teach you?" "He always called to himself and answered himself with his own voice." "Hold on!" Xuansha exclaimed. "Now that Ruiyan has passed, who is going to ask the question, and who will reply?" Xuansha beat him with a big stick, and kicked him out of the monastery. Ruiyan was playing at banking with his own money, being both debtor and creditor, just for fun. Every koan calls out to your own master. You may call it "master," as Ruiyan did, but you can also name it the essence of mind. You must meet the master face to face. Through constant effort, you will be able to enter the samadhi where there is no "master" to meet, and no "you" to meet the master. Unless you pass this gate of samadhi, which is the gateless gate, you will only see the shallow part of this koan, thinking of "master" as your own conscience. That would be just gratuitous speculation. This is the youth of natural beauty. Yoki's gracefulness is cast into the shade. Seishi and Yoki are noted as the most beautiful women in the history of China. The ethical teachings or guidance on human conduct one may draw out of a certain koan are all of secondary importance. If one looks only at such accompanying merits of koan, he altogether misses their primary significance. 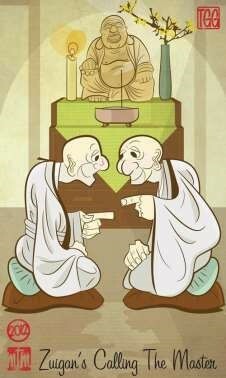 This koan is not merely an ethical teaching to follow Ruiyan's example of self-examination and introspection. For Ruiyan, the real Master is manifest and alive in his calling out and in his answering. Here the Master is "Absolute Subjectivity," which transcends both subjectivity and objectivity and freely creates and uses them. It is "Fundamental Subjectivity," which can never be objectified or conceptualized and is complete in itself, with the full significance of existence in itself. To call it by these names is already a mistake. It is an ever unnameable reality called "Master" (Ruiyan), "original face" (Huineng), "true man of no title" (Linji), or represented by Jinha's finger. It is the "I" in "Before Abraham was I am" (John 8:58). Gudo (above) calls this Absolute Subjectivity "the youth of natural beauty" -- even rare Chinese beauties would look faded beside it. Ruiyan had a heart-to-heart smile with the youth of natural beauty after long and hard training under Yantou. He lived, enjoyed, and used the Master in himself. The calling Master and the answering Master cannot be two, but must be the One Absolute Master of Absolute Subjectivity. In short, Ruiyan's Master is your Master, my Master, here and now. The Master is always here now and is "awake" in your standing and sitting. How to go its own way. From beginning to end, Ruiyan's koan was just "Master!" What is the "master"? It is your essential nature -- Buddha nature, the primal face before your parents were born, Mu (GG1), the sound of one hand, Masagin (GG18), Kinshiketsu (GG21), a finger (GG3), a flower (GG6). It is the inside of the whole universe. When Ruiyan calls "Master!" you may think that the one who calls is his superficial "I" and the master called to is his true essential nature. That is a misconception. The one calling Ruiyan and the one called are both Ruiyan's essential nature. The ego does not have substantial existence. It is merely a concept or a kid of delusion. When you have once attained true self-realization, you will realize that what you think of as an ego is nothing but a kind of wave of, or glorious light from, your essential nature. As long as you are controlled or pulled around by concepts, including that of ego, they are your enemy because they are the obstacles to obtaining enlightenment. But if you once attain true self-realization, you will acknowledge that all concepts are nothing but the glorious light of your self-nature. In the "others" mentioned here, even Shakyamuni Buddha and Bodhidharma must be included. Even though Shakyamuni Buddha may come and say "You are wrong," or "Your enlightenment is not true," you should not be confused but should rely on your realization. how can there be calling or answering? is free of even a particle of dust. it comes and goes, leaving no traces. Stillness, the origin of every vibration.